This story cannot be called a pure “lie”, but it was heavily misleading on multiple issues. It claimed that a singer was forced to mute the word “Bombay” from his song. The news came out, well after the New Censor Board headed by Pahlaj Nihalani, had taken over. BUT, this story never clarified that this decision was of the earlier board. The concerned singer posted the Censor Board certificate just 12 hours after the story was published by Scroll. The certificate was dated 05/12/2014, which means the decision was taken by the Leela Samson headed Censor board, yet the Scroll piece tried to insinuate that otherwise. And as we had reported earlier, the usual suspects spun it to make it an anti-Modi event. Couldn’t Scroll ask the singer for the censor certificate first? Secondly, as mentioned in our post above, Bollywood Director Vivek Agnihotri revealed to us that the move of muting “Bombay” is a well settled stand. Yet the Scroll piece attempted to highlight this as a new event, thus further leading the outrage industry to believe this was done by the new Censor board. Unfortunately, reporting the full facts of a story has become too hard for our Media. In this article, Times of India claimed that MPs from many states, including Uttar Pradesh and Delhi, had not spent a single rupee from their MPLAD fund. It said “It is much the same in poll-bound Delhi, where all 7 MPs, all from BJP, have not found use for the Rs 2.5 crore released to them as first installment”. To contest this claim, MP from New Delhi constituency, Meenakshi Lekhi had to use Facebook. In her post, she claimed that Times of India did not even approach her before running the story and she gave a detailed timeline of how the money was received and utilised by her. Lekhi made her stand clear, wonder how many other MPs have been wrongly maligned by Times of India. On #AIBRoast, will only enquire if the AIB had taken appropriate certificate. No moral policing if they r allowed by law, I can't stop them. As can be seen, the tweet claimed that Satish Verma is an accused in a fake encounter case, and an investigator in an another. This causes a conflict of Interest because he is investigation a fake encounter case involving PP Pandey, who again is investigating Verma’s case. Eventually a twitter user @centerofright to set the record straight. He tweeted an excerpt of the SIT report which clearly said Satish Verma was mistakenly listed as an accused, when he was actually a witness. Reddit then tweeted another tweet clarifying the situation, but, did not delete the wrong tweet which is still being Retweeted and read by innocent readers. We have added a Times of India story link as an example. We have already reported about this separately here. While Media gleefully used words like “attacked” and “vandalized”, the Principal of this school came out in the open and made this statement “This is not a case of vandalism, no religious articles have been touched”. Its a shame that Media chose to communalize an incident which even the aggrieved party clearly said had nothing to do with any communal angle. To India Today’s credit, they immediately apologised and later took down the article, although some other media sites continued to report it. 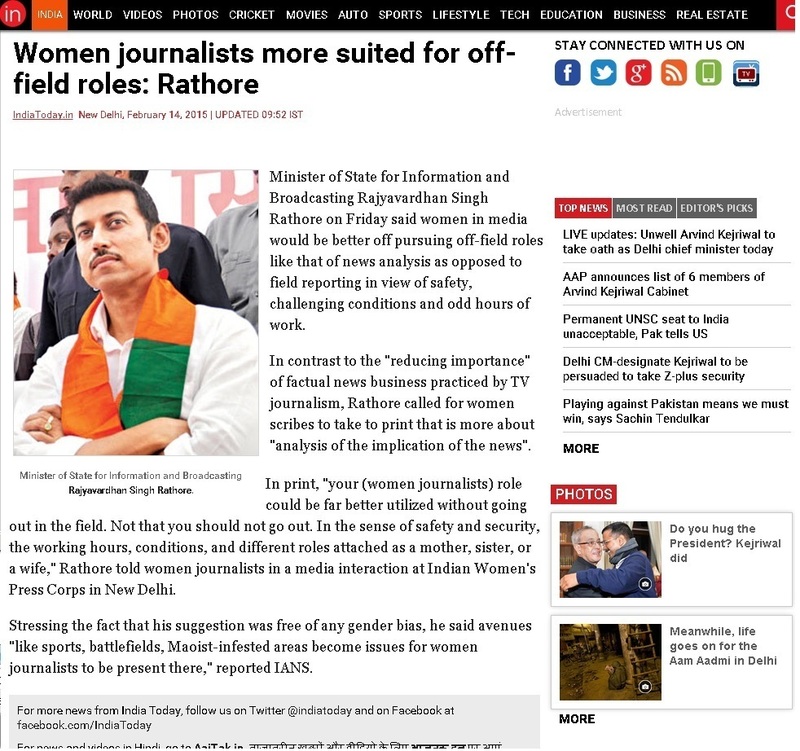 Later, the Economic Times posted Rathore’s comments in full, which made it clear he wasn’t guilty of promoting gender bias. The cost of Modi’s suit was yet another thing no-one in the media got right. While some claimed it cost Rs 10 lakhs, some media houses gave a wide range of Rs 80000 to Rs 5 lakh. We wrote a detailed post on this, where the person who gifted the suit, rubbished all astronomical figures being quoted by Media. A technical glitch was reported as “a blow to transparency” by an over-enthusiastic and possibly motivated Times of India journalist. We have written a detailed story on this, which was later blown up on Twitter as a major sign of fascism by Modi Government. Eventually the official handle of the PMO had to clarify the position, which the Times of India reporter could have confirmed with just a phone call to the department.